Senior guard Mei-Lyn Bautista drives into the paint for a contested layup in a game against Fordham Saturday. Women’s basketball struggled against Fordham in the Atlantic 10 opener for both teams at the Smith Center Saturday afternoon. 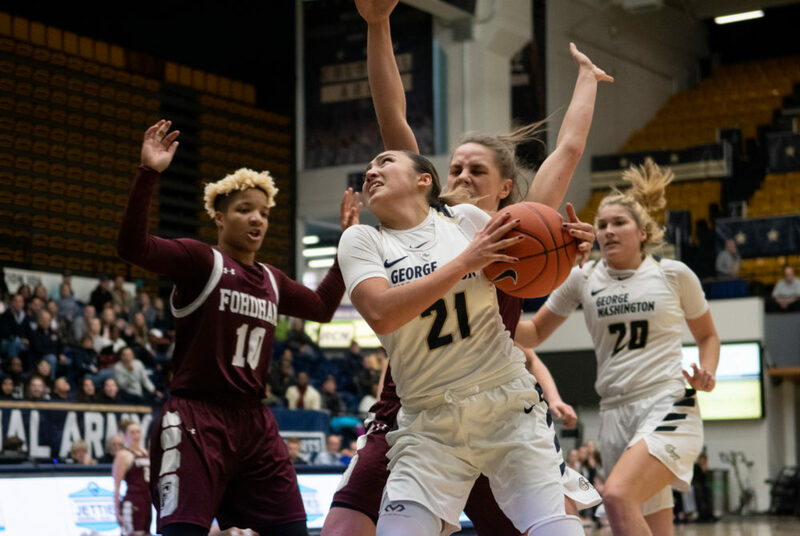 GW (3-11, 0-1 A-10) was more efficient from the floor than Fordham (10-5, 1-0 A-10), shooting 34.0 percent from the field compared to 30.5 percent for the Rams – but the Rams’ long-range shooting gave them the edge in a 50–38 victory. The Rams secured 10 three-point shots during the contest and outrebounded the Colonials 44-32 on the day. Fordham also bested GW in offensive rebounds, grabbing 13 to GW’s three. The Colonials’ leading scorers were sparks off the bench for the team. Freshman center Kayla Mokwuah led the Colonials with 13 points in 16 minutes of action while sophomore forward Neila Luma added 12 points to the mix. Head coach Jennifer Rizzotti went deep into her bench, rotating through 10 different players throughout the game. Fordham came into the match riding a four-game win streak and built on that momentum, ending the day with three players in double-digit scoring against GW. Redshirt sophomore guard Bre Cavanaugh and senior forward Mary Goulding both had double-doubles with 12 points and 10 rebounds, and 10 points and 12 rebounds, respectively. Senior guard Lauren Holden led the way with 14 points. The Rams limited GW to 1-for-11 shooting from beyond the arc in the game while shooting 35.7 percent from the same spot on 10-for-28 shooting. The Rams sprinted out to a 9–2 lead early in the frame after draining three consecutive shots from beyond the arc. Fordham connected on seven of its 11 attempts from three-point range in the first quarter. Holden was 4-for-4 from three in the first quarter alone, topping her 8.6 points per game average after just a few minutes of action. She entered the contest averaging 27.8 percent from range but improved to 57.1 percent against GW. The Rams led 17–2 with 5:02 left in the frame as GW struggled to find its footing from the field. Redshirt sophomore forward Olivia Gumbs was the only Colonial on the scoreboard in that span. The Colonials struggled to stop the visitors from running out to a 23–12 lead by the end of the first quarter. GW’s defense tightened up in the second quarter. The Colonials limited the Rams to just seven points and forced them to give up six turnovers in the frame. But the defensive improvement was futile, as the Colonials tallied just six points of their own in the quarter and failed to cut into Fordham’s lead. GW shot 34.8 percent from the floor but did not connect on either of the team’s two three-point attempts to end the first half. Luma came off the bench for GW and led the team in scoring at halftime with eight points. Holden led all players with 12 points and Cavanaugh was also in double digits with 10 of her own. The Rams also outrebounded the Colonials 18-13 in the half en route to a 30–18 lead at the break. Luma started the second half over senior forward Kelsi Mahoney, who was visibly frustrated after committing her third turnover late in the second quarter. Luma scored GW’s first points of the half with a mid-range jumper with 9:20 left to play to cut into Fordham’s lead 32–20. But the Rams held the Colonials scoreless from that point on, until Mokwuah made two free throws with less than a minute remaining in the frame. The Rams did not let up and scored 16 points, including threes from Goulding and freshman forward Kaitlyn Downey to carry a 46–22 lead into the final 10 minutes of play. The Colonials shot 7.1 percent from the floor in the third quarter and missed all six of their three-point attempts. GW picked up just four points in the penultimate quarter and lost the battle on the boards, 17–10. The Colonials had their best offensive output of the game in the fourth quarter. Senior guard Mei-Lyn Bautista hit the Colonials’ first three of the game to open her scoring account less than a minute into the fourth quarter to make score 48–25. GW racked up 16 points on 70.0 percent shooting in the final frame but it wasn’t enough to close the gap to the Rams. Mokwuah came alive in the fourth quarter, scoring nine of her 13 points on the day. She also had four rebounds and one of GW’s two steals in the contest. Cavanaugh finished with 12 points, well below her season average of 18.5, and shot 23.5 percent from the floor. The Colonials again proved their ability to play elite defense, shutting down arguably the best scorer in the A-10, but failed to pick up enough points to take advantage. The Colonials travel to take on Rhode Island – a team that has lost five straight games – Wednesday. Tipoff is scheduled for 7 p.m.